In the early 70’s, after returning home from a tough day of ice climbing in the Chamonix valley, Yvon Chouinard, teamed up with a local forge and ice axe maker to craft the first dropped-pick ice axe. 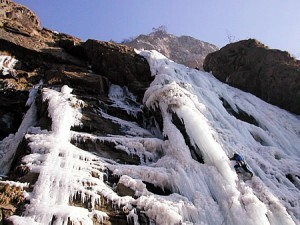 Ice climbing has never been the same since. Whether you want a classic ice climb or the latest mixed route, there is something for everyone in the Alps. Do you want to work on your ice leading? With its multitude of class 2-3 ice routes, La Cremarie in Chamonix is the perfect place to start. Val di Cogne, just across the border in Italy is an ice climber’s dream, with many different canyons of ice leading to all types of climbs. Also nearby, Trient, Switzerland offers a good selection of easily accessible ice. Ice is usually best from mid-December until some time in early March. Come test your skills and tour the Grivel or Simond factory while here, or order a hand-made axe from Zermatt or Grindewald.